“For years I’ve tried to capture him, and I’ve come close, so very close, but each time he’s narrowly evaded my grasp! Not a corner of London is safe while Ratigan is at large. There’s no evil scheme he wouldn’t concoct. No depravity he wouldn’t commit. Who knows what dastardly scheme that villian may be plotting even as we speak.” Quoted Basil of Bakerstreet. Disney continued to astound and amaze back in the 80’s. This little gem of a movie fell under the rug and led you to believe it wasn’t Disney at all. It fell under the category of The Black Cauldron and other obscurities that the company doesn’t mention. For myself, I loved this movie. It is still among my favorite Disney animated movies, probably for the sheer excitement and energy that the movie had. It didn’t dwell on too many feelings. It gave you the movie for what it was. A mystery. 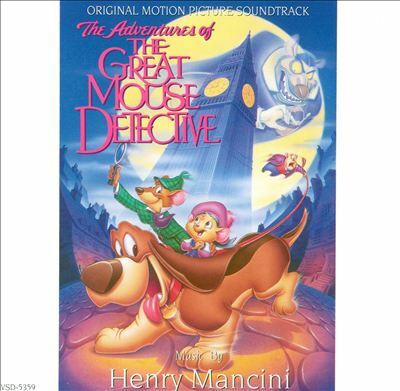 What is The Great Mouse Detective about? Here is the plot…When the young mouse Olivia (Susanne Pollatschek) sees her toymaker father, Hiram (Alan Young), abducted by a peg-legged bat, she runs to find famous mouse detective Basil of Baker Street (Barrie Ingham). Basiltakes the case and soon finds out that the rodent toymaker was kidnapped by the evil Professor Ratigan (Vincent Price), who wants to use the toymaker’s skills in a fiendish plot to replace the Queen of England with a robotic clone that he can control. For an animated movie, they couldn’t quite tie down just one director. There were in fact four different directors Ron Clements, Burny Mattinson, John Musker, David Michener. This film is among the Disney Animated Classics Collection. The score is done by none other than Henry Mancini. Yes, I’ve been on that kick lately, but hey his music is great in 1980’s cinema! You can find the score on Amazon for the CD. You can also find the score on the Amazon MP3 page as well. Here is the ITunes link, in case you don’t use Amazon. Would you like to hear some clips? Well That’s all this week everyone! This coming week you can look forward to hearing about Funny Face and more! See you next week for Highlander! Happy Listening! Previous Previous post: Hey Joe, It’s The Rise of Cobra!